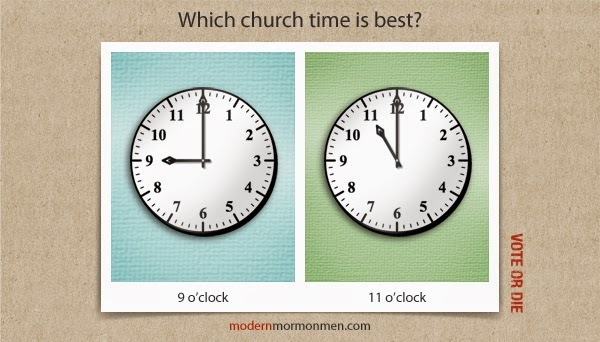 Modern Mormon Men: Vote or Die 9: Which Church Time Is Best? Vote or Die 9: Which Church Time Is Best? It’s a new year! A time for renewal, a time for resolve, a time for change. For most of us, the hours we have been designated to attend our local ward congregation has shifted with the new year. Most LDS church schedules go for three hours on Sundays rotating annually between 9am to 12pm, 11am to 2pm, and 1pm to 4pm. (I know there are exceptions to this, but these are the most common.) So which one is the coveted slot? I’m automatically throwing out 1 o’clock because it is so obviously the worst (barring aforementioned exceptions like 2:30pm to 5:30pm—what!?). If 1 o’clock is your favorite time slot, I’m not sure I even want you taking this survey. If you feel strongly about it, go ahead and try to win us over in the comment section. We’ve probably all had a similar dialogue about the two earlier spots. 9 o’clock is a little too early, but it's great because you get it over with and have the rest of your Sunday ahead of you. 11 o’clock gives you a bit of time to sleep in, but getting out at 2 doesn't quite have the same swagger that getting out at noon does. Scott Heffernan is a graphic designer and photographer in Seattle. He works on the creative team at Archie McPhee doing all manner of strange things. He grew up a child of the ‘80s in Salt Lake City, served a mission to England/Wales, and got a degree in American Sign Language from the University of Utah. After marrying his sweetheart, they moved to Seattle and had three beautiful baby boys together. He loves toys, skateboarding, and thrift store shopping and has impeccable Modar. Twitter: @ScottHeffernan. Tumblr: ScottHeff.tumblr.com.